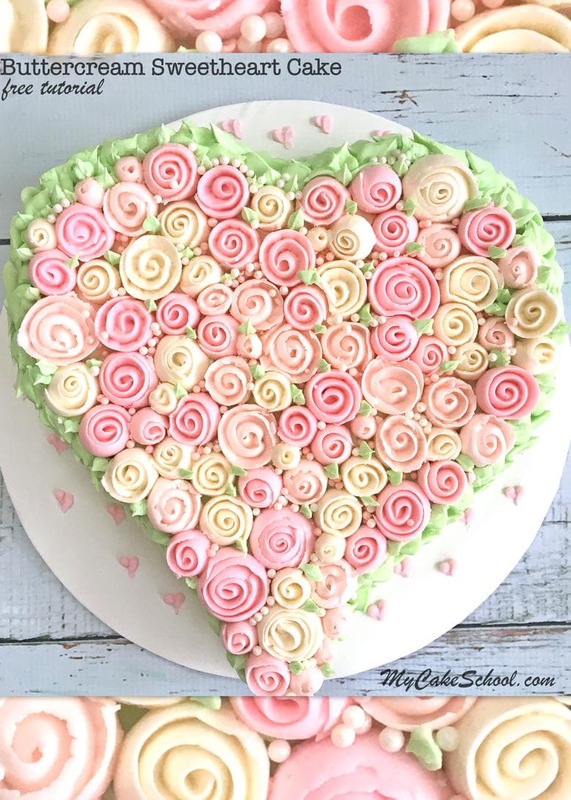 In this quick and easy Buttercream Ribbon Rose Heart Cake Tutorial, I’m going to demonstrate how to cover a heart shaped cake in beautiful blanket of buttercream ribbon roses. This technique is so much easier than it looks, and can be applied to all sorts of cake designs! I love cakes and cupcakes that feature piped buttercream flowers, and ribbon roses are among the easiest buttercream flowers to make. If you are new to buttercream piping, ribbon roses are a great place to start. 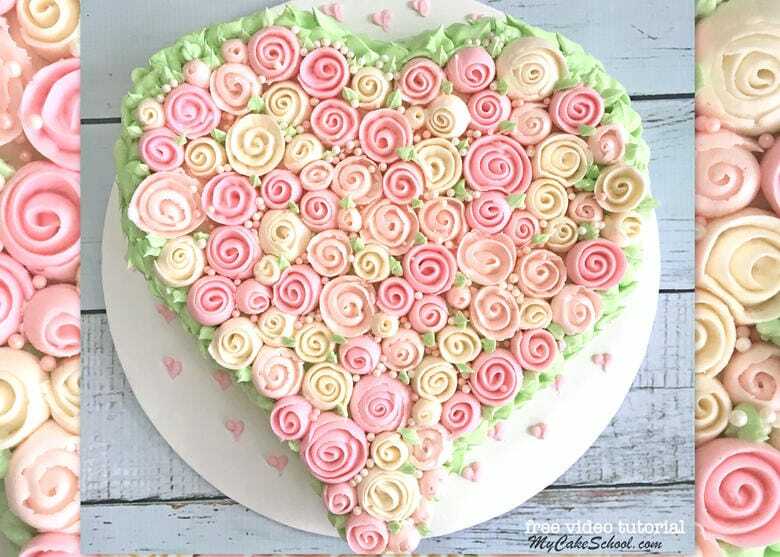 This romantic buttercream ribbon rose sweetheart cake would be perfect for all sorts of occasions including Valentine’s Day, anniversaries, and engagement parties. Once you’ve gotten the hang of them, you’ll want to add ribbon roses to everything! They make such a sweet & quick accent for cakes and cupcakes. For this video tutorial, we decorated a heart shaped cake (baked in a 9 inch heart pan) with tinted Pink Champagne Buttercream. Any buttercream frosting would work for this, but frostings containing butter (rather than shortening) will work best as they will firm up more quickly when chilled. Our Classic Vanilla Buttercream is a good choice also. Cake board/Cake base. For our cake base, we used three cardboard cake circles wrapped with a white plastic tablecloth (secured underneath with staples). Sugar Pearls: Optional. I sprinkled a few pink & white sugar pearls between the roses as filler. 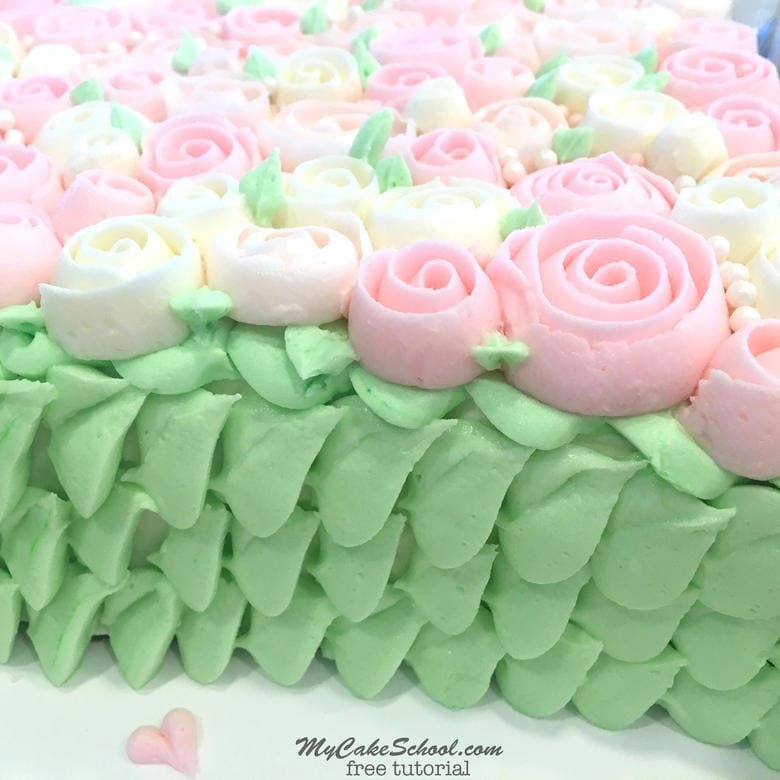 I crumb coated my cake in white frosting but next time I would crumb coat in green frosting so that any small spaces between the roses would just look like leaves in the background. I piped lots and lots of roses…more than I actually used but I still used approximately 70-80 roses of all different sizes. If you do not enjoy this much piping, or if you don’t have time, you may consider using less time consuming filler flowers like hydrangeas (2D star tip) or rosettes (tip 21 or 2D). Here’s a view of the piping that we did around the sides! Large piped buttercream leaves make for a beautifully unique (and easy) design! Thanks for stopping by, we hope that you enjoyed the video! **If you’re interested in even more Valentine’s Day or love themed cakes and sweets, check out our Valentine’s Day Roundup of Cake and Cupcake Ideas! Thanks Melissa. Great tips to make beautiful cake. I recently made a cake with all roses on top. your tip would have helped lot. Your Tutorial was so easy to watch and so helpful Thanks Bunches! Well, if I ever have a girlfriend I would love to celebrate my valentine’s day with a cake exactly like this one.Oh god! look at that cake.Where can I find a girlfriend?